It's surprising that more people aren't aware of the Lansing Day of .Net (LDODN). This past Saturday marked the third time this event was held in the greater Lansing area. Every instance outdistances their previous efforts. 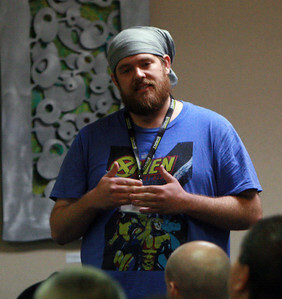 Like most code camps, this community-run event features “eyes-front” presentations delivered by experts in the community. But in Lansing, they always offer a little of the unexpected. The first year, the mayor of Lansing showed up to discuss the role of technology in the economy; At the second LDODN, the event was held at The Breslin Center - home of the Michigan State University basketball team; and this most recent LDODN held many surprises. The conference took place at the TechSmith campus. TechSmith, which makes some great software like SnagIt and Camtasia Studio, operates out of Okemos, MI. Two large classrooms accommodated the two tracks of LDODN. Notice anything about these sessions? Although the conference has ".Net" in the title, only three talks focused on Microsoft technologies. This was far more than a .Net or Microsoft-focused conference. Instead, we had talks on open source (jQuery), web standards (HTML5), and vendor-agnostic technologies (Cloud computing). A plurality of talks focused on soft skills (Diversity, Project Management, You, Be A Better Developer). Clearly the organizing team kept the Day of .Net branding only to provide continuity; They chose the best content they could find, regardless of the technology stack. For the record, I attended 3 sessions: Michael Wood's Field Guide to Moving to the Cloud; Leon Gersing's You; and Leon Gersing's jQuery. Mike Wood is an Azure MVP but his presentation was applicable to any cloud vendor. Key points: Understand how to secure your data when you move offsite; Estimate the demand on your application, so you can scale appropriately; Decide what parts of your application should be kept in-house; Don't migrate your mission critical application first. Leon Gersing's You presentation was a thought-provoking treatise on how one can take better control of one's life by becoming aware of what your own needs are and of how others perceive you. There was a lot to this talk and the large audience was engaged. I recorded an interview with Leon on this subject and I plan to release it soon on Technology And Friends. Leon's jQuery presentation was a 100-level talk. It was mostly review for me, but I found it useful because I am scheduled to deliver a similar presentation this week at MADExpo, so I wanted to steal some ideas. Like most good conferences, LDODN offered more than presentations. This one featured a catered lunch and dinner. Dinner is rare at a one-day conference. The food was first-rate (Chipotle burritos for lunch; and barbecue dinner from the Michigan Brewing Company). After dinner, the celebration began with a dunk tank. 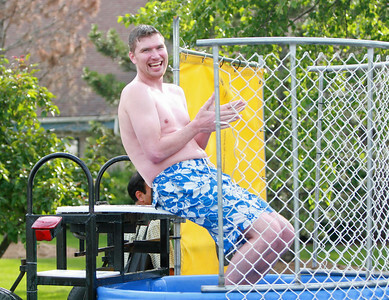 Dennis Burton, Jeff McWherter and other leaders in the Lansing development community agreed to get dunked for charity. All proceeds benefited Lansing's Impression 5 Museum, which hosts the Lansing Give Camp each year. An inflatable slide provided more fun for those stayed late. And I haven't told you the best part. During the raffle, dozens of books, software and hardware was given away. And I won a brand-new iPad! 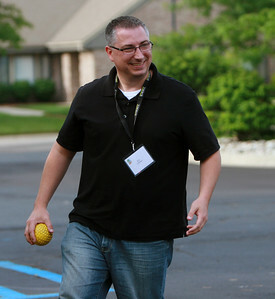 At the June 15 meeting of the Great Lakes Area .Net Users Group, Microsoft Developer Evangelist Brian Prince delivered a presentation titled “A Lap Around Windows Azure”. As an INETA Mentor, one of my responsibilities is to approve requests from user groups seeking to join INETA. The user group should have a clearly stated purpose and that purpose should be related to Microsoft technologies. In the states I cover, there are groups devoted to .Net, SharePoint, and Architecture. A group doesn’t need to focus only on Microsoft technologies, but there must be some focus there. A user group needs to commit to hold regular meetings at a consistent time and place. Monthly meetings are by far the most common and are frequent enough to keep members engaged. Generally, I require a group hold three monthly meetings before I will approve them for INETA membership. I frequently get requests from user groups that have yet to hold even a single meeting. I don't want to approve a group; then learn a few months later that they never actually held a meeting or that the group fizzled after one meeting. Running a group is a lot of work and I want to make sure the group's leadership is in place and committed before approving that group. The "three meeting" rule above helps to verify this commitment. The group should be open to the public. Some companies sponsor user groups for their own employees and don't allow non-employees to attend. Others require attendees to pay dues each year or an admission fee to each meeting. I haven't had a membership request from such a group, but I would not accept them if they had a restrictive rule like these. If a group wants to attract members, it is essential that they have some sort of web presence. This can be a web site or a single page or a subscription to meetup.com or any way that I can find them using a popular search engine. Users should not need to sign in before viewing the web page, so Facebook pages and BaseCamp accounts do not meet this criteria. At a minimum, this web presence should state the date, time, location, and frequency of the each meeting. The topic of the next meeting should also appear on this page, but I would probably approve the group without this, since so many groups do not provide this information. Generally, I apply the criteria above before approving a user group for INETA membership. These rules are not carved in stone and I might consider deviating from them if a group leader presents a strong case, but they are a good starting point for that conversation. It's also worth noting that I am the INEAT mentor for Michigan, Pennsylvania, and West Virginia, so I approve groups only in those three states. Other mentors in other states may apply slightly different rules. User groups are welcome to apply for INETA membership before they have met all these criteria. They will remain in the "Pending" state until I approve them. Send me an e-mail (David Giard (At) David Giard (Dot) com) if you have a user group and would like to apply to INETA. You can learn more about INETA at http://ineta.org. Charles Stacy Harris III of Microsoft and Gus Issa of GHI spoke about the .Net Micro Framework and The Internet of Things at the April 2011 meeting of the Great Lakes Area .Net User Group. Their presentation included deploying code to electronic boards, robots, vehicles, and even a washing machine! I’m a big fan of the Deep Fried Bytes podcast. I’ve listened to every episode since Keith Elder and Chris “Woody” Woodruff began recording years ago. So I was thrilled when they asked me to be a guest on Deep Fried Bytes this month. We talked about Data Visualization. I recently developed a presentation titled “Data Visualization – The Ideas of Edward Tufte” that I’ve delivered at the Kalamazoo X and at Codestock. I’m scheduled to deliver it again at Devlink. Keith was packing for a fishing trip the night we recorded, so Woody and I spoke via Skype for the better part of an hour. I think it turned out very well. I had a blast and I hope I get invited back. You can hear the interview and download it at http://deepfriedbytes.com/podcast/episode-71-talking-data-visualization-on-an-audio-podcast/. This year's Codestock was my third and it did not disappoint. I was scheduled to deliver two presentations - Visual Studio 2010 Database Tools and An Introduction to Object-Oriented Programming. These were two talks I had not given for some time and I altered both considerably since I last delivered them. I stayed up most of Thursday night preparing to deliver them during the first two time slots Friday. By 11AM, I was finished presenting and prepared to relax and enjoy the conference. After a leisurely lunch, I attended Seth Juarez's 2-hour presentation on Machine Learning. I heard about this talk last year and was determined not to miss it this year. Seth described algorithms that allow computers to predict results after observing a set of sample data. I was impressed enough with this talk to invite Seth onto Technology and Friends. The keynote address was Friday evening at the nearby Bijou Theater. Charles Petzold - one of the world's most famous computer science authors - delivered an impressive narrative about scientists of the 19th century. He began with the work of William Thomson (who later became Lord Kelvin) and his analog computer designed to predict the height of tides. Petzold expanded the talk to cover Thomson's clashes with the geologist of his time and with naturalist Charles Darwin. Petzold was informative and entertaining and delivered one of the best keynotes I've ever heard. I was thrilled when he agreed to appear on my TV show the next day. Saturday was supposed to be spent taking in sessions and open spaces. But a speaker canceled at the last-minute and I was asked to fill in. I chose to do a talk on Data Visualization, which I originally delivered at the Kalamazoo X conference and which I am scheduled to deliver at Devlink in August. Originally, this talk was only 30 minutes but there were so many good questions that it lasted almost 60 minutes. 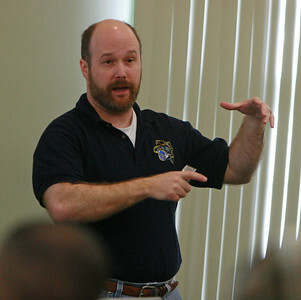 Later in the day, Mike Eaton asked me to help him deliver a presentation on user interfaces. I stood near the stage and made a few contributions, but he did not need my assistance. Mike showed off some impressive WPF applications he has built and described why he made the design decisions in these applications. I brought some work with me - a problem with Microsoft Windows Identity Foundation with which I had been struggling - and Microsoft Evangelist Brian Prince was kind enough to sit with me and patiently answer my questions. This assistance alone was worth the trip. I brought my video camera and recorded 5 episodes of Technology and Friends, which will air over the next few weeks. I also filmed some spots for a user group project I’m assembling. The final result will be published in October. Improbably, I did not take any photos at the conference.